The essential function of bone is to transmit mechanical forces and thus enable movement. Bone is therefore adapted for a lifetime of withstanding maximum forces which act upon it. These maximum forces cause small, elastic deformations of bone. These deformations are measured in μStrain (1000 μStrain = 0.1% change in length). If these deformations exceed a certain threshold, bone growth is stimulated. However, if these deformations are below a second (lower) threshold then bone is removed. This control circuit called Mechanostat was thoroughly described by Harold Frost*, his related research and publications go back to the 1960s. Examples of the adaptation of the system are; the bone loss seen in astronauts during long-term space flights and also in the elderly who lead sedentary lifestyles over a longer period. Both will suffer from a function-related bone loss, which can easily be confused with a pathological osteoporosis. Function-related bone loss can be compensated for by targeted training. Somewhat surprisingly, the maximum forces acting on bones are not created directly by external influences, but by the muscles themselves. This becomes clear when one takes the typical leverage ratios in the body into account. A good example is the ankle. A healthy person hopping on one leg (like when using a skipping rope), generates a force which is roughly equivalent to 3.5 times the body weight. This force, obviously, is generated mainly by the calf muscle. 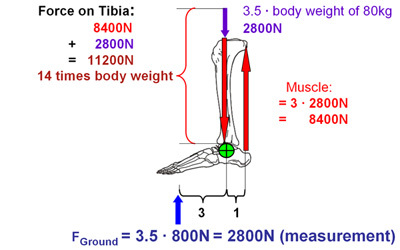 If we consider that the ratio between the distance from the forefoot to the ankle and the distance from the ankle to the Achilles tendon that is attached to the calf muscle, is approximately 3:1, the calf muscle must generate a force that corresponds to 10.5 times body weight in order to produce a force of 3.5 times the body weight at the forefoot (ground reaction force). Since the calf muscle requires an abutment, this force must therefore also act on the bone. So during everyday movements a force of 14 times body weight or more can act easily on the lower leg bones. For a person with a body mass of 80 kg this would correspond to a weight of over one ton, i.e. the weight of a small car. For comparison: Hitting the ground with a straight leg, a force equal to typically 2 or 3 times body weight is generated. In this case, however, there is no leverage, so that the same force acts on the bone. This simple example shows that, normally, the contribution of muscle forces on bone is significantly larger than external forces. The peak forces described above in a healthy, fit subject result in a deformation of bone between 1000 μStrain and 2000 μStrain. In a tibia length (shin-bone length) of about 40 cm this corresponds to a deformation between 0.4 mm and 0.8 mm. This shows the magnitude of the impact of everyday movements in bone strength.